TOTAL FLANKER...a rugby blog: Ban the Tackle? Scientists and doctors have again called for tackling in school rugby to be banned. Researchers from the Sport Collision Injury Collective (which I assume is a thing) claim that kids are at risk of serious injury, pointing out that tackling is responsible for nearly 64% of all injuries and 87% of concussions. They also make the very valid point that many PE teachers in schools are not qualified to coach the game and yet full contact rugby is compulsory in 73% of schools in England. I’m not about to question the facts. The conclusion – banning tackling in schools – is, however, something of a leap. 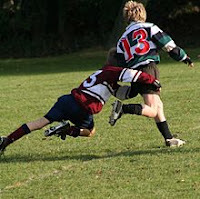 - Make full contact rugby non-compulsory, so only those who want to play are taught to tackle.